Forum Home > eBay, LeBonCoin, Mercado Libre, Yahoo Japan, etc. 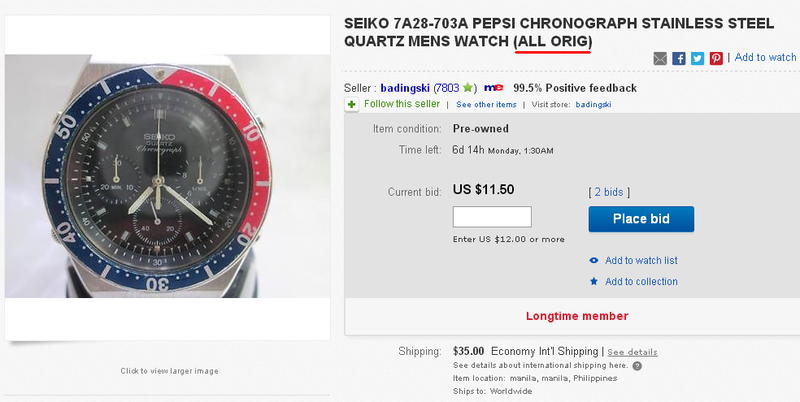 > Original bezel? I think not! Caveat Emptor! but at least this one actually works. May as well carry on using your original topic's title though, Daz. Perhaps I don't know enough about 7A28's to spout forth with authority, but something strikes me as wrong about this 7A28-7100. 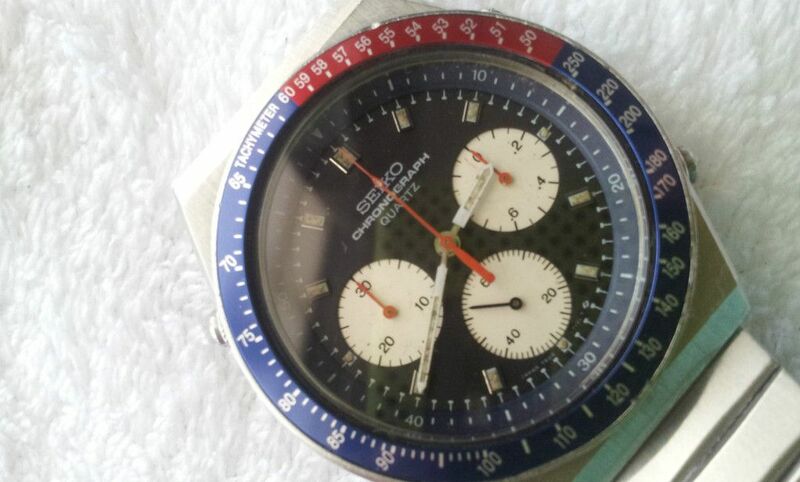 In his description the seller states: BEZEL: Chapter ring original. Note: Chapter ring - not bezel insert, mind you. Not only the problems with he bezel insert, but I was looking at the lume on the hour marks and hands- would they be that way because of moisture in the case? This latest offering by Filipino arch-watch-botcher Badingski has already been posted (justifably) in the 'Bottom of the Barrel' thread. But knowing well how James abhors the all-too-common cut down replacement bezel insert, it also fits quite nicely in this topic too. 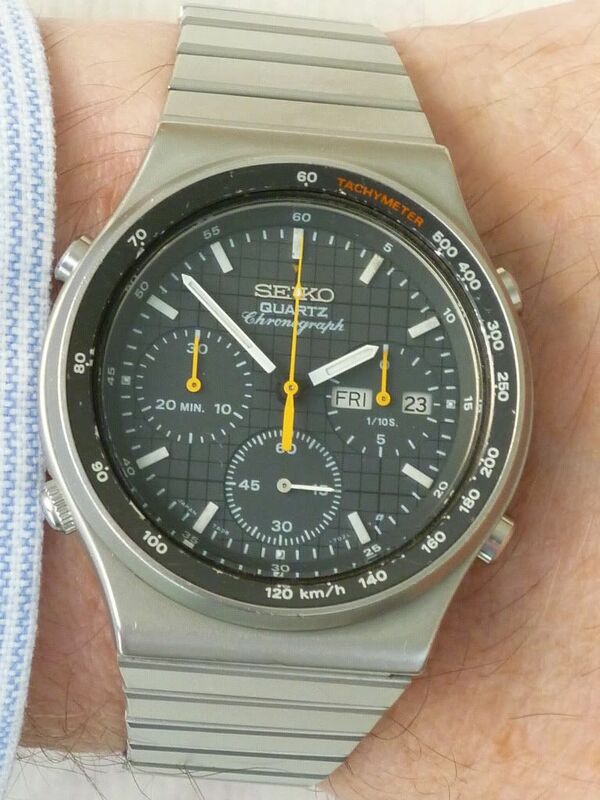 .... but ends there, with no mention of the incorrect, previously used cut-down bezel insert that's been fitted. Another Badingski badly botched-up Bishop, from the bench of Ramoncito Bangit. The black after-market bezel insert is just the tip of the iceberg. There's hardly any red left on the watch at all. There's scant mention in his description of the obvious cut-down after-market bezel insert he's fitted to this JDM 7A28-7040. I wasn't sure whether to start a new thread, but this pre-existing topic, with 'Caveat Emptor' in the title seems to fit the bill well enough. Gentlemen. I fear as a collecting community we may have proverbially shot ourselves in the foot - or opened a 7Axx Pandora's Box. In the foregoing posts you can see a few examples: most of them pretty horrible failed attempts of 'cut down' replacement bezel inserts fitted to 7A28 / 7A38 'Divers' by various watch botchers. Now we have a far better solution: Yobokies 7A28 / 7A38 repro' inserts. From the outset, I've had concerns as to what effect their availabilty might have on the market for these desirable models, which are often let down by tatty graunched original bezel inserts - and had already expressed my concerns privately to other forum members. 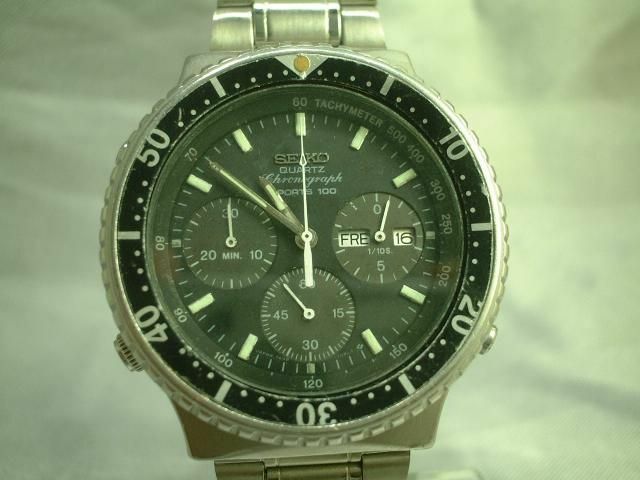 Hello here is a used Seiko 7A28-7049 Men's Stainless Steel Sports 100 Chronograph Watch. 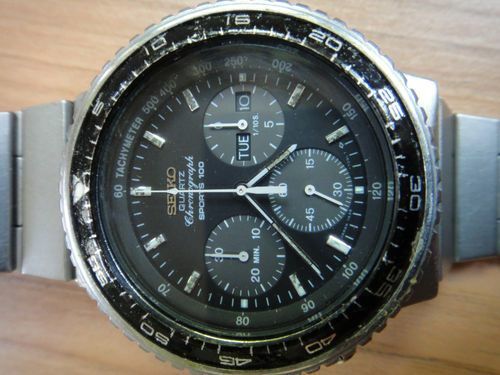 This is Seiko's first chronograph analog quartz watch. 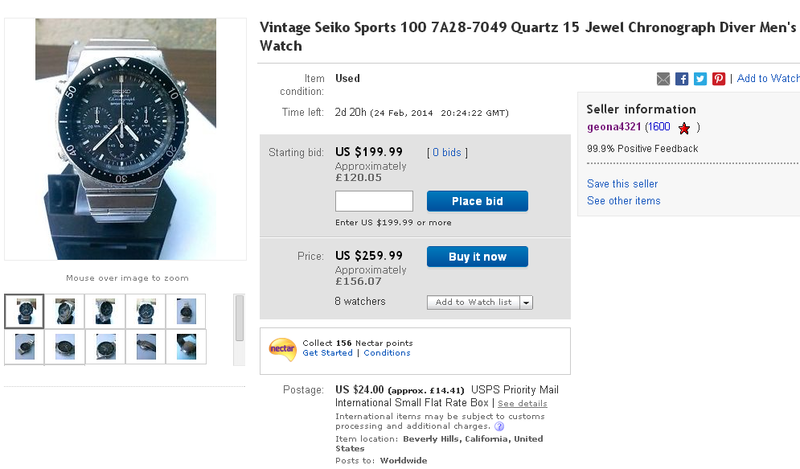 It has a 15 jewel quartz movement. All the functions work and it keeps accurate time. The hands resets to zero. A new battery has just been installed. Watch diameter is 41mm. The band is sized to fit a 7.5 inch wrist. You can get another 1/8 inch by adjusting the pin on the clasp. The watch has wear to it. The band and case have scratches from use. With the band having most of the scratches. The crystal and marked bezel are new. Also a new rear seal was installed. The bezel rotates and clicks. 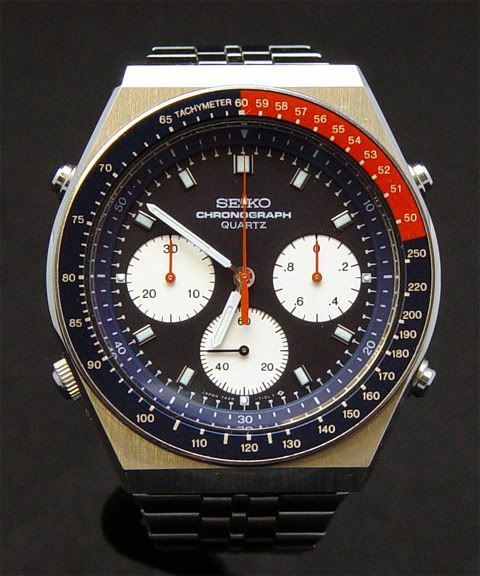 This is a cool classic collectible Seiko. 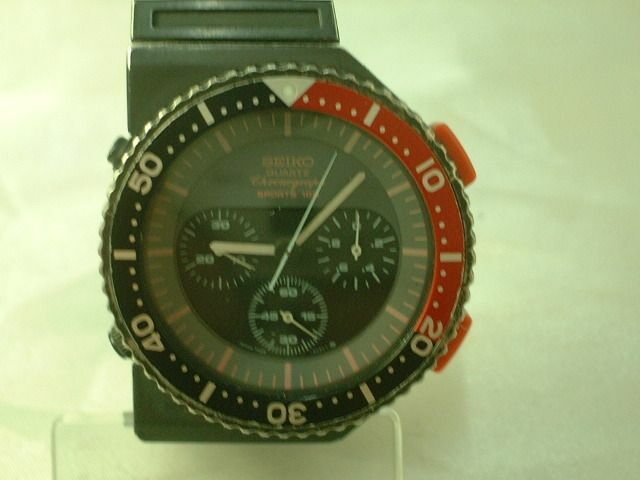 I have more cool watches so Check out my other items! 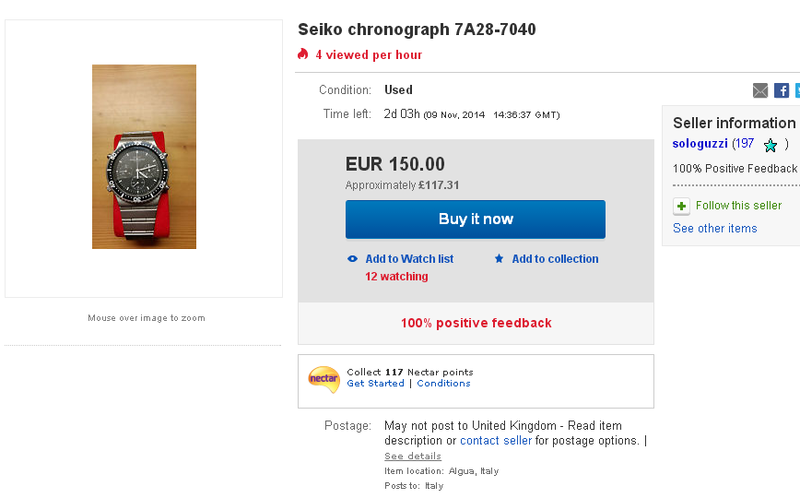 You only need to look closely at the seller's first photo to see that the 'new' bezel insert is not in keeping with the (otherwise pretty badly knocked about) condition of the rest of the watch. It's very obviously been fitted with one of Yobokies' new repro' bezel inserts. As you can see from my screen print above, this otherwise only average to well-worn condition 7A28-7049 has already been bid from its opening $149.99 starting price to over $200 in less than 12 hours. 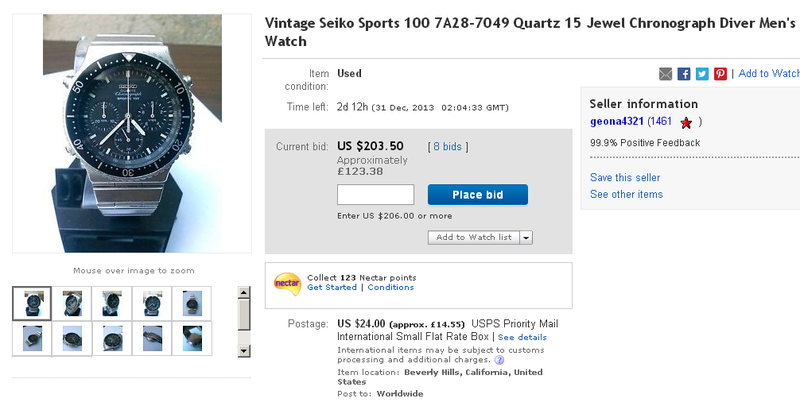 I suspect it'll probably go a lot higher (mostly thanks to that $27 repro' bezel insert fitted). 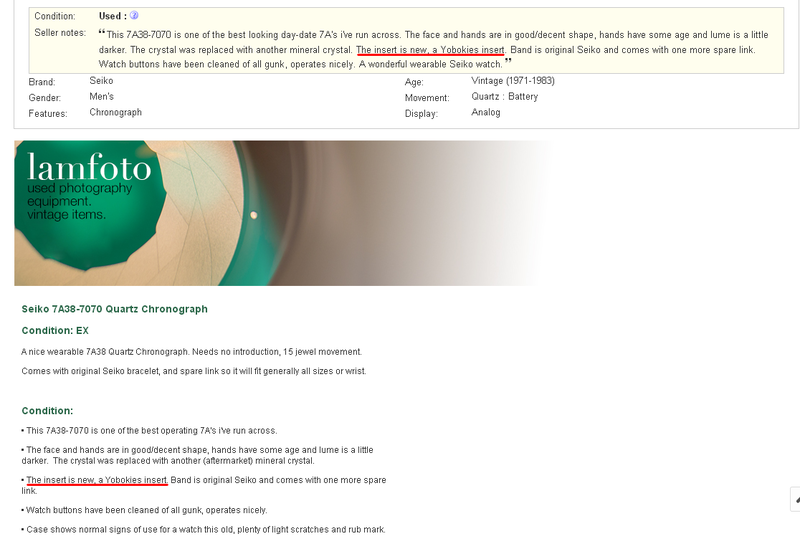 In this case, the seller has been open enough in his description (although I highlighted the sections in red). 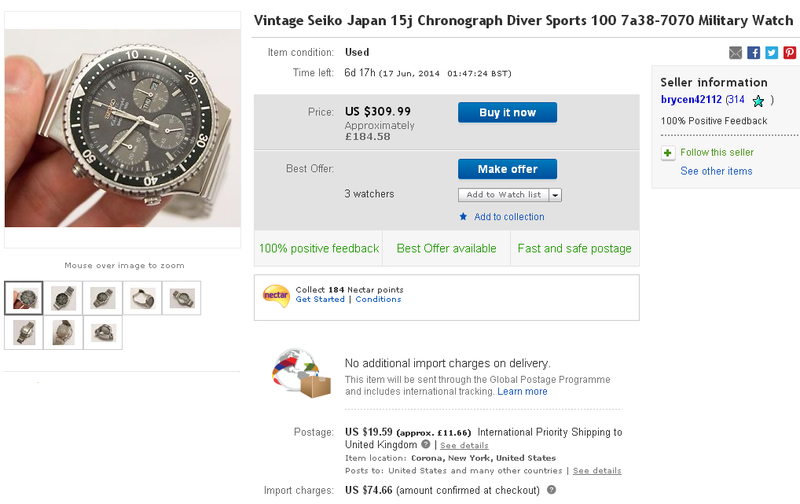 In future, other unscrupulous eBay sellers may be less forthcoming. 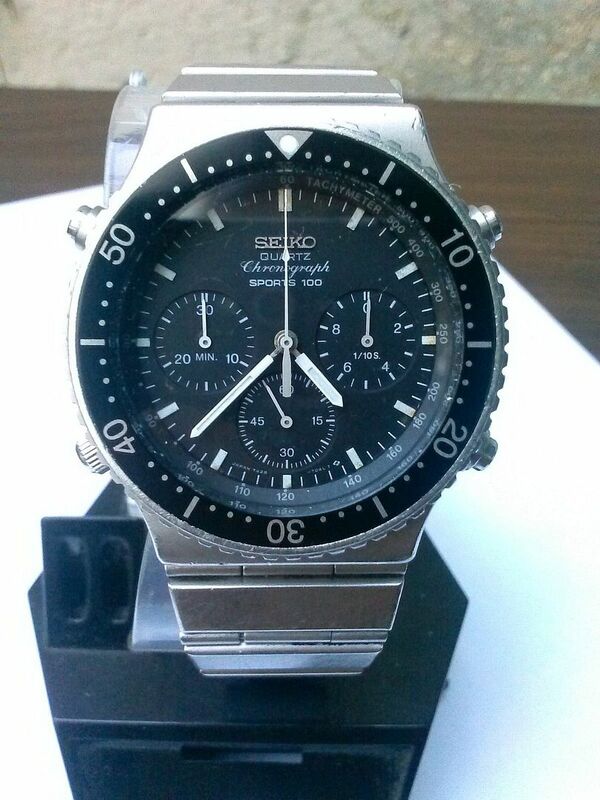 Fortunately, it is possible to distinguish between Harold's repro's and the original Seiko bezel insert - but only if you look very closely. With that thread now having received over 3000 views from all over the world, I expect to see a few more in the not-too-distant future. Hmm. Not sure what happened to that auction. Looks like maybe buyers and the seller got cold feet and withdrew it. Ended early. 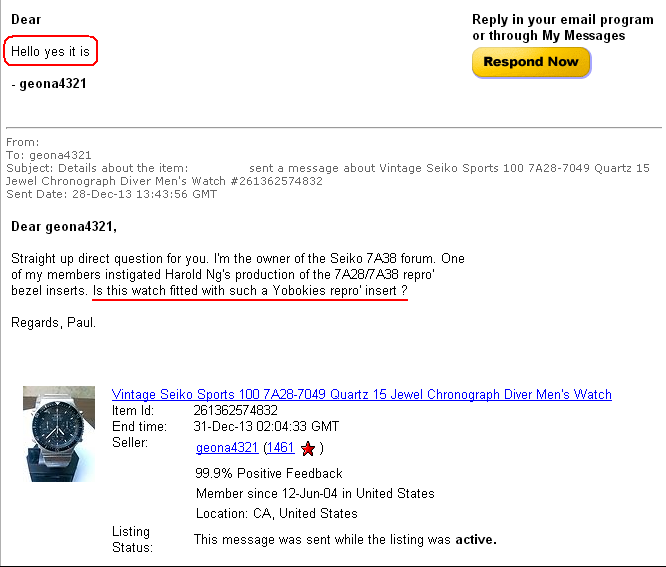 This time, the seller's description includes the rather less ambiguous statement: The marked bezel is new aftermarket. 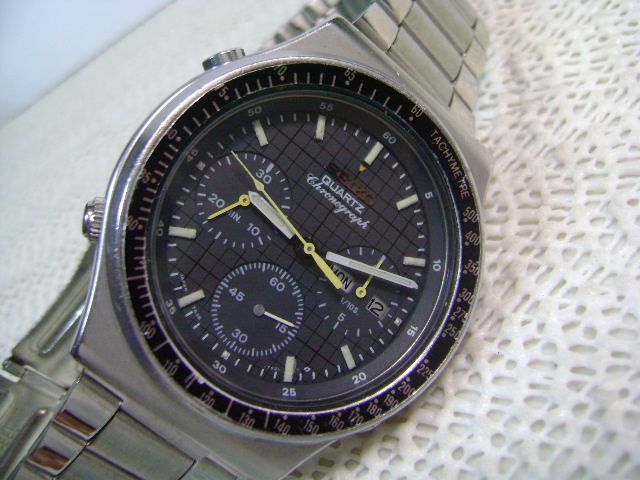 There's plenty else wrong with the watch, but one thing's for certain, the bezel - or at least the Tachymeter insert fitted isn't original ! I'm not quite sure what it's off, but it looks like it has been (badly) trimmed down to fit. I wouldn't normally have bothered to mention this - indeed, I didn't first time around, because there simply was no need to. However, as I have a distinct loathing for devious but lazy would-be profiteering re-sellers .... I certainly am going to now. 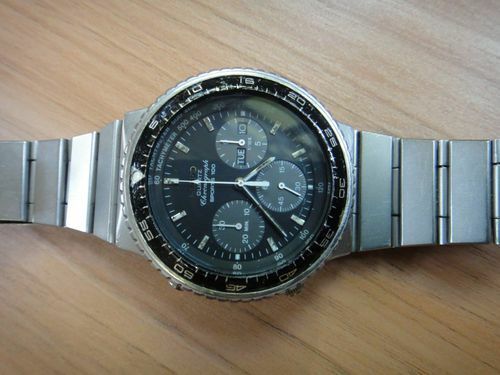 This 7A38-7070 was listed overnight by US eBay seller brycen42112, whose activities I've criticized on a few previous occasions. 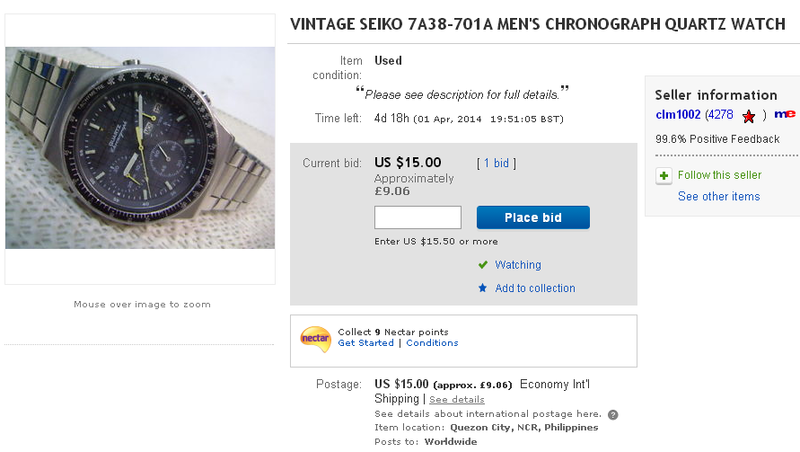 SELLING A7A38 SEIKO WATCH MADE IN JAPAN. VERY LARGE 15jMOVEMENT INSIDE THE CASE, ALL THE FUNCTIONS WORK AS THEY SHOULD, NEW CRYSTAL WAS INSTALLED SO NO SCRATCHES ON IT, NORMAL WEAR AND TEAR ON THE WATCH FROM AGE BUT OVERALL IN GOOD CONDITION. BEZEL ROTATES WITHOUT ISSUE. I JUST INSTALLED A NEW BATTERY. JUST HAD THE HANDS "RELUMED/WHITEN". WATCH FITS A SMALL WRIST. 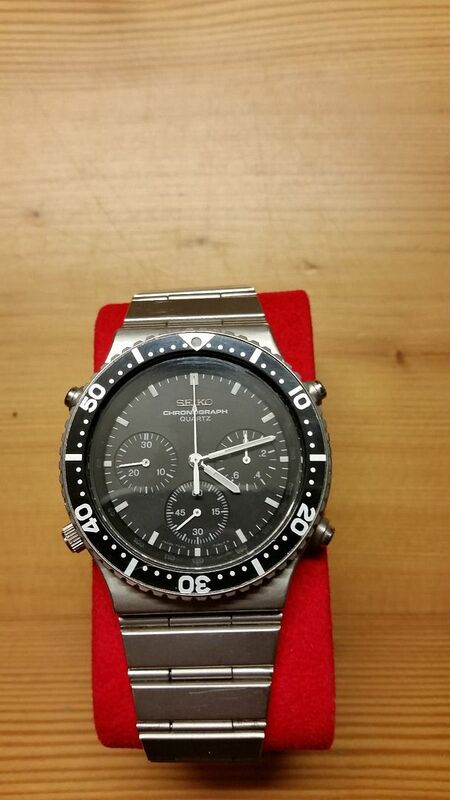 THESE ARE VERY DESIRABLE MODELS, CHECK OTHER SIMILAR WATCHES 7A28 AND 7A38 ON EBAY AND YOU WILL SEE FOR YOURSELF. BUY NOW IS 309.99 BUT AS STATED, OPEN TO BEST OFFER. SHIPPING/HANDLING/WITH TRACKING ANYWHERE IN THE U.S. WILL BE FREE SHIPPED TO A CONFIRMED ADDRESS ONLY. You'll notice there's no mention of the bezel insert fitted. Looks good, doesn't it ? It's actually Yobokies after-market repro' insert. How can I be so sure of this ? Simples. How do I know this is exactly the same watch ? Because this lazy b*st*rd is re-using all 8 of Dave's photos from his listing !! He's changed the order slightly - using Dave's own finger held shot (which was Dave's second photo) as the primary image. Caveat Emptor, as always, Gentlemen. You'd have thought that seeing as we facilitated and have serially plugged Yobokies repro' 7Axx 'Diver' bezel inserts, over a year ago, that watch-botchers would have stopped fitting other 'cut-down' bezel inserts by now. Right ? Well not in Italy they haven't. Oggetto usato ma in ottime condizioni, completamente originale, cinturino in acciaio inossidabile originale, completamente revisionato e perfettamente funzionante, origini militari. Not quite 'completely original'. I guess this one must be intended for the short-sighted wearer. An otherwise fairly reasonable-looking JDM 7A28-7040 too - ruined by some idiot.